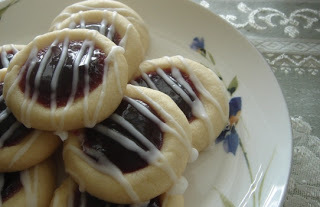 Day 4 of our 12 Days of Cookies features Raspberry Almond Shortbread Thumbprint Cookies… yum! In a small bowl with wire whisk, stir together all glaze ingredients until smooth. Drizzle over cooled cookies. Makes 3 1/2 dozen cookies.This recipe, and 349 others can be found in our cookbook “Rocky Mountain Lodge & Cabins Favorite Recipes” which can be purchased in our Gift Shop. Click Here to order your copy.